Alexandra Grant is known for large-scale works that explore and blur the boundaries between images and words. Inspired by philosophic, literary and visual sources, Grant’s drawing/paintings, sculpture, and video present large, rhizomesque text-scapes. 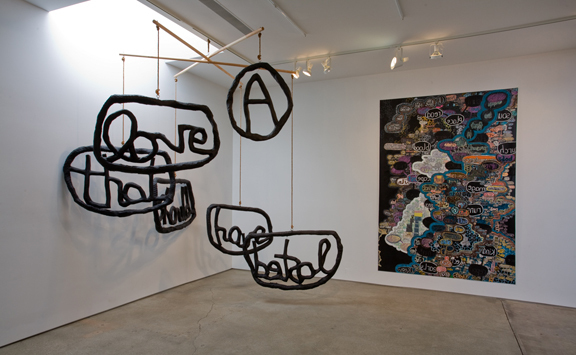 In her works on paper, words are handwritten in reverse to remove any sense of font or style, resulting in a playful conflation of sign and signifier. By slowing an easy “read” or apprehension of meaning, Grant translates words into images of language itself. 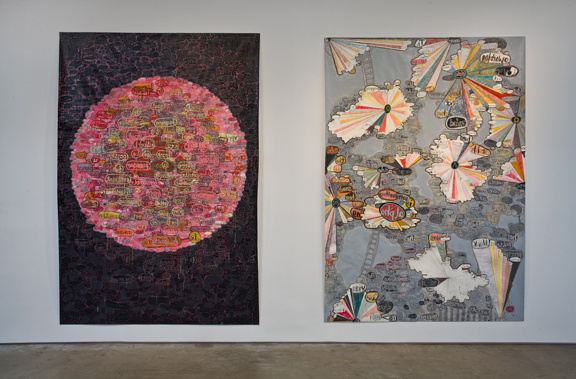 Grant’s texts are inter-connected by bubbles and strings, and aggregrate and accrete in the space of her large frames like cities or organisms. They present what she terms “an image of a system” rather than any known system of communication: the literal read of language is frustrated, leaving instead a narrative open-endedness. This raises questions on the arbitrary nature of language and meaning, and how both influence our seeing and perception. Complementing Grant’s conceptual approach is her equal interest in the formal aspects of composition – in color, texture, and space – and in creating images of striking complexity. The series of drawing/paintings in A.D.D.G. (aux dehors des guillemets) takes as their point of departure six “Portals,” or sutras – meditations on the five senses and the mind. 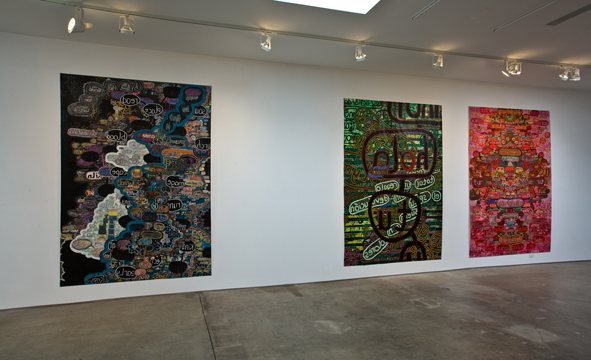 Written for her purposes by writer and collaborator Michael Joyce, the texts inform Grant’s painting in unpredictable ways. 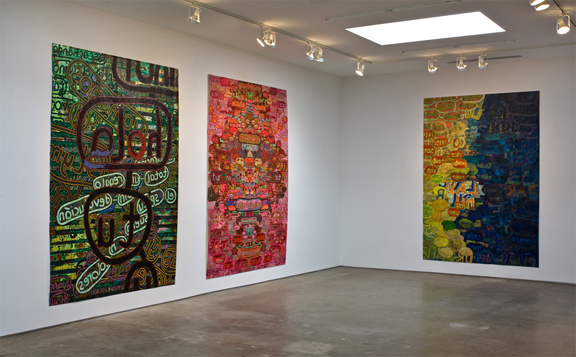 She works through a series using an unusual methodology whereby she creates visual rules about color and motifs and then breaks them, moving seamlessly between reasoned and intuitive decisions. The six large works on paper on show are complemented by a mobile sculpture and a series of videos. 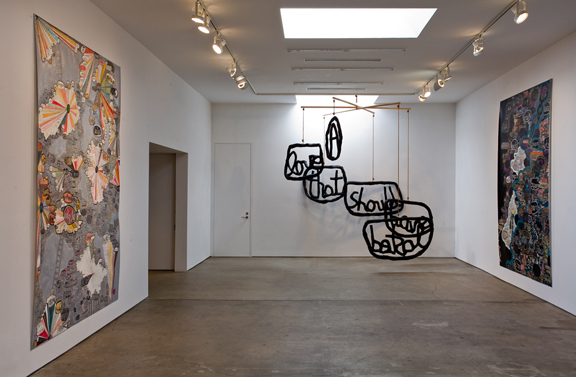 Grant’s videos juxtapose images of her two-dimensional work and sculpture with readings of the texts that inspired them, introducing time and montage to her exploration of language as image. Grant crosses boundaries between disciplines as easily as between theory and practice, embracing equally what is gained as well as lost in the translation. Her approach undermines the idea of clear beginnings and ends: the works on paper can be considered not only finished pieces of art, but subjects for experimental video. The sculpture, “A love that should have lasted,” is based on a phrase within the First Portal (sight) and is linked to the scale of words in the Third Portal (touch). By re-presenting textual themes, Grant links the relationships between seeing and reading, word and objects, and art and theory. Alexandra Grant was raised in Mexico, Spain, France and the US. She studied art and architecture at Swarthmore College and the California College of the Arts, before moving to Los Angeles in 2001. Her work was recently the subject of a MOCA Focus show.